Chris specialises in Research Methods and Statistics in Psychology (1003PSY) and Experimental Design and Analysis (2000PSY) at Griffith’s Gold Coast campus. 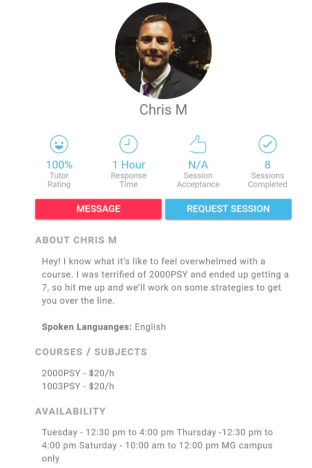 He is a five-star tutor available in person both on and off campus as well as online via Skype. Lauren is a postgraduate Medical student on Griffith’s Gold Coast campus with five years tutoring experience. 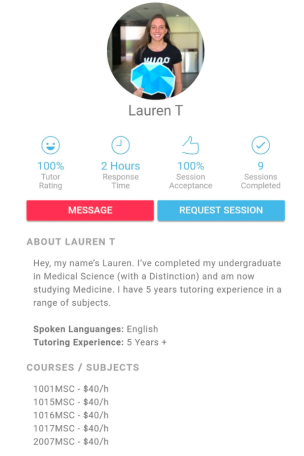 She is a five-star tutor available in person both on and off campus as well as online via Skype. Classes she tutors include: 1001MSC, 1015MSC, 1016MSC, 1017MSC and 2007MSC. Do you have a favourite Griffith Vygo tutor? Let us know in the comments below to help us grow this list!